Lately I keep having flashbacks to August, 2009. If you've been following me that long then you might remember how my posts suddenly veered off in the general direction of Dirk Bogarde for pretty much a solid year. I have 40 posts tagged with "Dirk Bogarde" on this blog. FORTY. At the time I felt kind of guilty for blogging about him so much, because I assumed (and I'm pretty sure I was correct in assuming) that 99% of my blog readers couldn't possibly care less about Dirk Bogarde. I even had a giveaway where I volunteered to send a Bogarde DVD to anyone who asked for one. Not just one winner, ANYONE WHO ASKED ME. And then I was depressed that only like five people took me up on the offer. I just really wanted to spread the Dirk love, you guys! Anyway, all this to say... 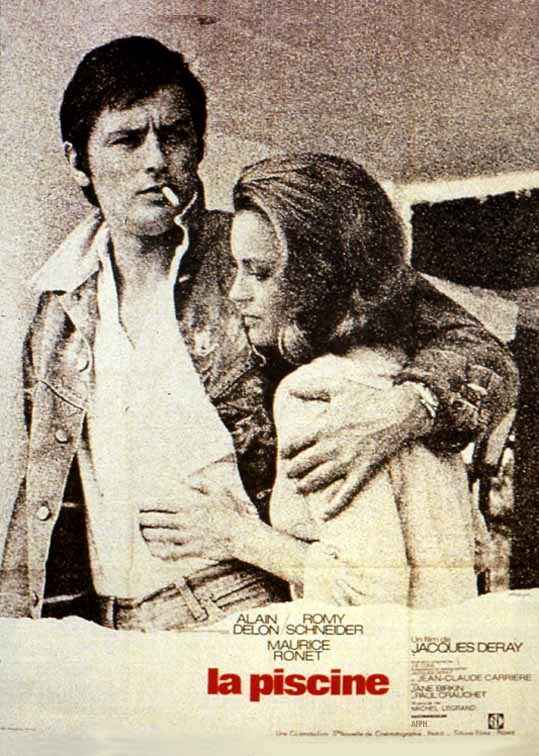 I'm kind of going through that again with Alain Delon. Like I said in my last post, I had downloaded a bunch of his movies in 2010 and I've been playing catch-up for the last several months. It's almost weird how 2010 Kate was basically preparing 2015 Kate for this obsession. I was like "I'll just get my ducks in a row now, and then five years from now IT SHALL BEGIN." I'm trying really hard not to go overboard on Silents and Talkies, though. It's kind of fun (in the most embarrassing way possible) to look back on all of my Dirk Bogarde posts, but I probably lost a nice chunk of my readers who, understandably, weren't interested anymore when I turned into a broken-record blogging nightmare. Okay, I watched this for the first time last year and I had rated it 4/5. It went in my 2015 Favorites list, just not at the top. I loved it, but I wasn't in love with it. Sometimes you revisit a movie and all of a sudden there's this urgency to watching it, like your heart is racing faster and your eyes are so glued to the screen that it becomes physically impossible to look away. Actual heart palpitations. You're simultaneously aching for more but wishing it wouldn't move along so you could savor it longer. Vapid characters that are bored by long summer days spent lying in the sun -- but you empathize with them anyway. An atmosphere so thick with humidity and languid tranquility that I felt the need to shed layers and take a dip in a pool, despite being palpably enveloped in a New Jersey winter. A mellow soundtrack that I need to track down and purchase and listen to whenever my nerves need soothing. A story that takes you places you never expected when you sat down to watch a movie that disguised itself as nothing but a slow summer holiday on celluloid. I'm pretty smitten with this review, but I still don't feel like it properly conveys how much I loved re-watching this movie. There are certain movies that seem to go further than just conveying sights and sounds and emotions. I swear you can feel the sizzle of the sun in this film. If it wasn't scientifically impossible, I'd go so far as to say the sun somehow travels from the screen directly onto your skin. It's tactile in a way that movies actually can't be. I don't think I can properly explain it, but the world created in this movie feels so real and present that after waking up this morning, I felt as if I had been in the movie last night. As I mentioned a couple of posts back, escapism is a major factor for me in watching movies so the whole "I feel like I lived this movie" thing is a big selling point in my book. This clip that was posted on youtube really conveys the mood of the film (and I really love the song that's playing throughout) If this seems like something that might interest you, too, it's available to stream (with English subtitles) on Amazon Prime here! I for one adore reading bloggers in the midst of crazy obsessions! It's so fun and personal and interesting. Also, brilliant work.